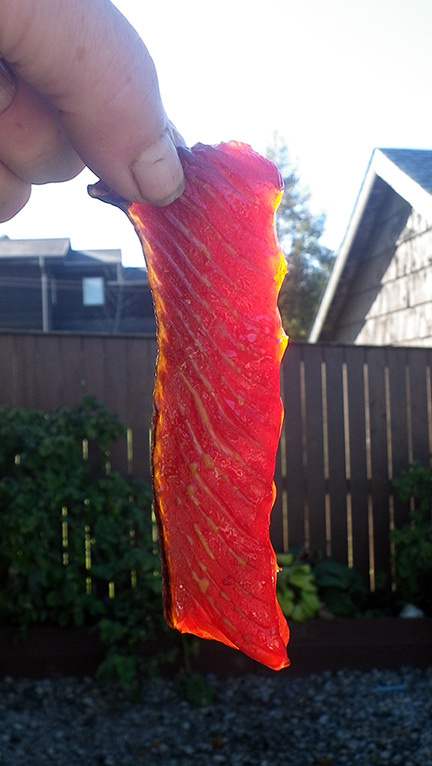 A good Buddy called a short spell ago, wondering if he could talk me into running off a batch of salmon candy. Tried to get him to go with the Cranberry Sweet Thia version, but NOPE! HAS to be the maple-honey "Gummy Bear" stuff. In this case we actually went with a mix of coho, red and white springs. Thawed the frozen salmon just enough to cut. Works a tad better to make what we're looking for when there are still ice crystals through it. Ripped the hides, pulled all the bones, and cut into strips. The brine was made the same morning, and given a spell to blend while we were cutting..
Place the strips into the brine and let it do it's thing. The strips can sit in brine as little as 24 hours, but double that is better when you can keep it cold. 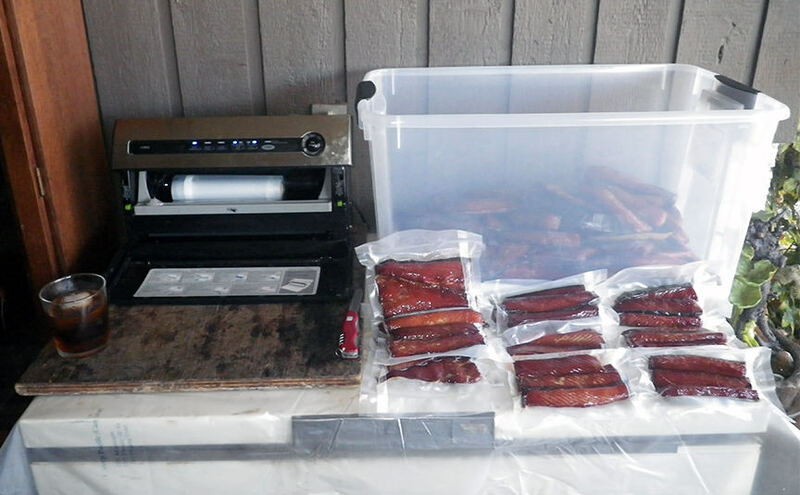 Prep the grills with a GOOD shot of BarBee Pam, and set them up on your drying table. Do NOT rinse the salmon strips when they come out of the brine. Lay each strip out on the grill such that they don't touch each other (or they WILL glue to each other). Now it's time for a visit to the preheated smoker. Once the product hits, I like to keep it medium low for this kind of candy. A combination of 50/50 Apple / Alder chips gives an almost "velvety" finish. My big stainless smoker usually runs a full load of chips up at medium temperatures in three hours. I generally give it that first shot, then have a look to decide if it needs a little more. Again, cooler days meant just that. In all cases this time around, 6 hours was just about perfect. The strips shrink down a fair bit, but if you've done your job right, they are still translucent, and indeed have the texture of a Salmon Gummy Bear! Was right pleased the sun made an appearance to help highlight the show! To finish I suggest letting sit in a cool place for 24 hours in larger ziplocks or some type of container. That allows the product to "settle" and the consistency to become... well... consistent. My ever blossoming belly... well... not so much. That's how I remember the recipe and process I followed last time I has enough salmon to make some candy. This year I might need to look into the Thai recipe you are promoting. Least ways for half the run, as a test. Great pics by the way. Especially the sunshine back lit one. Makes a guy's mouth water just looking at it. That is way too much goodness for any two or three guys!! Now where did I put the paper towels to wipe off my keyboard? MMMMm , That looks so good. ..
That does look very good! Bagged, Tagged & WELL Hidden! Slightly different recipe this time. Turned out AWESOME! Getting ready to make all my neighbors DROOL again!!! I can feel a ''road trip'' coming on when I get back from up island !!!!!!!!!! The door is open my Friend! 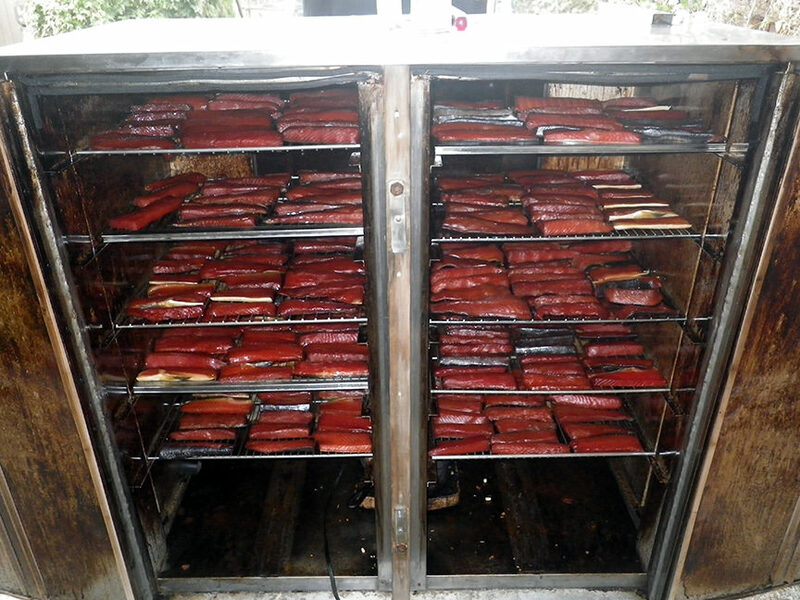 Right now the smoker is hard at it, and the entire neighborhood smells simply marvelous! Plan on hunting tonight, so I'll simply set the heat to low and wander off. Should be perfect by the time I get back. And of course, The BoogyMan will be snoozing ion the outside sofa - right next to the smoker which he rightfully believes is his! And yup, that is indeed a FULL Size coffin they are in. First 100 (rendered down to 60) pounds of a 350 pound run. Looks good Matt. Truth be told, that's the only way I really like salmon. Next 100 pounds on brine. I should head to Port and look for the ball of circling Seagulls! LOL! Circling Buddies perhaps, and the smoker ain't even fired up yet!! Color & consistency changes on track. I'd betcha that a similar kind of processing would work really well on pieces of beef.......... sort of a take on Biltong. One of my good Buddies called this fall, and was just in the process of running a handful of sockeye through this recipe. He also wanted to know if I had ever tried it with deer - specifically whitetails. 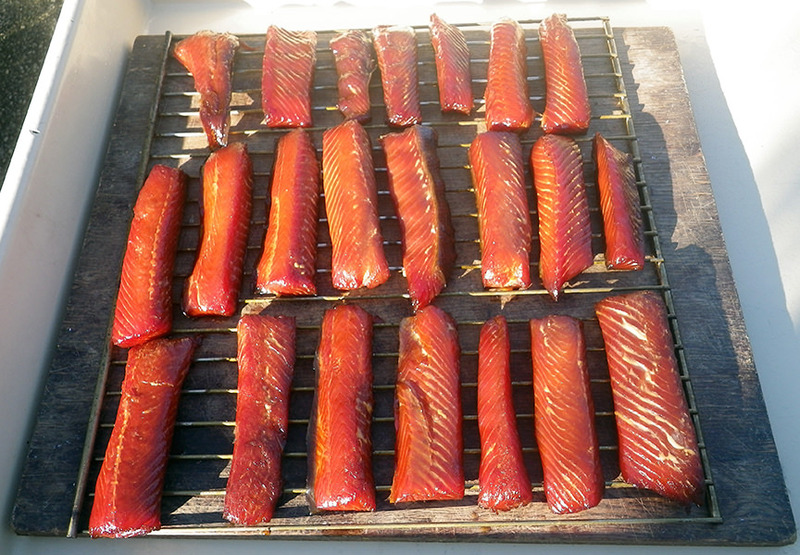 His sockeye turned out to be some of the best I have ever tasted. Actually exceeded the teacher in this case. And much to my utter surprise, the whitetail he then ran through the same recipe was DELICIOUS! So much so the two of us literally wiped out a couple pounds in one sitting before he hid the rest! Smoking a spell now, under rather low heat. The Lady declared this run "The Best you have EVER done" last night. And so any thoughts of a followup post promptly disappeared. The smoke is simply the "finish". The long brine ensures the salmon is cured right through. The long run on the fans dumps a huge amount of moisture, and forms the pellicle. 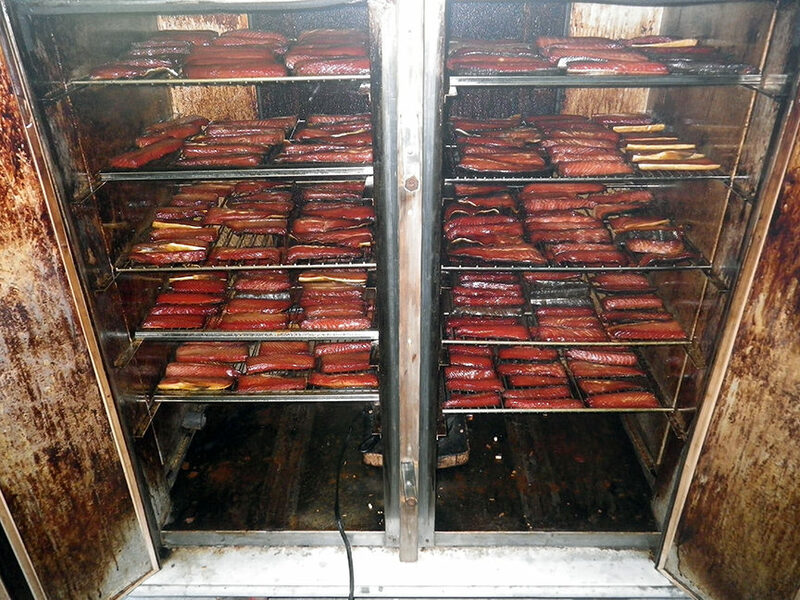 When they hit the smoker, they are already dry to the touch, and just a little "rubbery" inside. I run the smoker at as close to 125 - 130 degrees that I can. With all dampers wide open to keep airflow high. Most runs that takes around 4 - 5 hours to produce what I am looking for. This is closer to a cold smoke than hot. The smoke simply adds flavor, and contributes some to the final consistency. Got the last of it that I could rescue from the Lady & the neighbors bagged & tagged today. Even though no sunshine it stills kind of glows. This run is indeed one of the better ones we have pulled off. First run is now complete, and bagged & tagged. 86 bags of average 8 strips a bag = 688 strips. Next run under the fans now. Spent the entire day converting the final run into strips and dumping it into the brine. Tired, with a bit of a bulging belly! As in it is now complete! 300 pounds through the labor! Sum Bich Matt. My first time back on the forum in a while and I see a mountain of salmon candy. I buy them bags of salmon candy from Costco- great stuff- even if it is atlantic salmon ;) pretty much eat a whole bag first time around so need to get couple bags each time I get some. Well I've got to take my hat off to you Matt! 'gummy' snack as well as the bear pepperoni strips. You do a wonderful job! and delicious! The only problem I had with the pepperoni was my visiting son. which took a couple of hours, so when I returned there was only one stick left for me to try. He said it was the best he had ever eaten. Thanks again sir! One man should not tell another what to do BUT 2 things I have learned is NEVER TELL ANYONE how great the ISLAND is AND, never EVER let someone try your BEAR PEPPERONI !!!!!!!!!! I.M.H.O. ...Glenn (The result is,they move here and become bear hunters)!!!!!! You are more than welcome Big Lew! I am pleased to hear both you and your son liked what we came up with! !